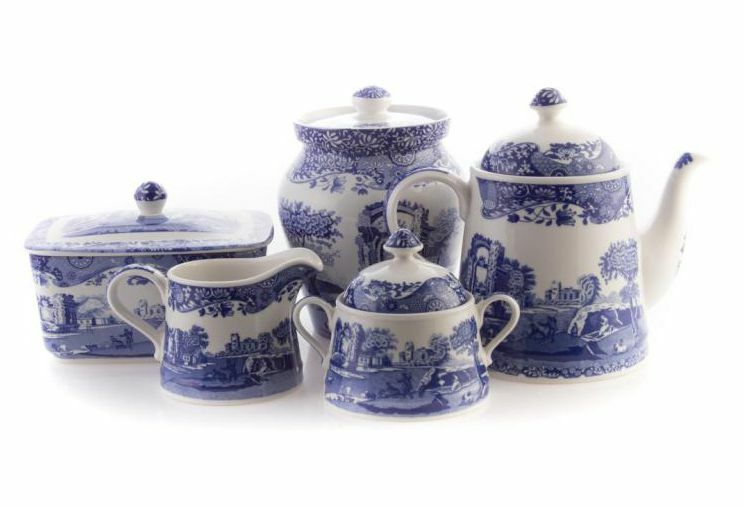 British porcelain got its start around 1770 when kaolin clay was found in Cornwall, England. Around 1880, the English made those ceramics lighter in weight, more translucent, and stronger by adding ground bone ash from farm animals to the wet clay, according to Antiques 101 by Frank Farmer Loomis IV. By 1842, Spode was one of the factories operating in England making what is known as “bone china” along with Coalport, Wedgwood, Worchester, and a number of other companies. Josiah Spode apprenticed as a potter in the mid-1700s, and by 1754 he went to work for William Banks in Stoke-on-Trent, Staffordshire, England. He went on to start his own pottery business making cream-colored earthenware and whiteware with blueprints. In 1770, he took over as the master of Banks’ factory and ended up purchasing the business in 1776, according to Warman’s Antiques & Collectibles (Krause Publications) edited by Noah Fleisher. By the early 1830s, Copeland acquired the Spode operations in London and took over the Stoke plants in subsequent years. Until he died in 1868, Copeland managed the business and then passed it on to his heirs. The factory was modernized in 1923, which included the addition of electric power. In 1976, Spode merged with Worcester Royal Porcelain to become Royal Worcester Spode, Ltd.
As noted above, the company went through a number of changes in ownership and developed many partnerships over its long life, not to mention varied factories producing pieces in different locations. The result is many, many different Spode marks being used on varied patterns. In fact, Pottery & Porcelain Marks by Chad Lage (Collector Books; now out of print), shows 31 different examples of Spode and/or Copeland marks dating from the mid-1700s through modern production. Spode Painted Backstamp (may have a number beneath) – Handwritten under the glaze, often in red, but other colors can be found as well including black and blue. Used on pieces dating between 1790 and 1827. SPODE – Incised in the china with no coloring. Used from 1814 to 1833. Copeland and Garrett – Mark used from 1833 to 1847, sometimes with “Late Spode” incorporated to distinguish these pieces due to the familiarity of the Spode name. Spode Copeland’s China England – A number of marks used both the Spode and Copeland name after the mid-1800s. Other good references for varied Spode and/or Copeland marks are Kovels’ Dictionary of Marks: Pottery & Porcelain 1650 to 1850 and Kovels’ New Dictionary of Marks: Pottery & Porcelain 1850 to the Present by the late Ralph Kovel and his wife Terry Kovel (Crown). The marks in these books, however, are hand drawn rather than photographed on actual porcelain pieces. Not all early pieces of Spode were marked, so they may be found with simply a hand painted pattern number under the glaze. These are often written in red, and shouldn’t be confused with date marks which were impressed in pieces from the late 1800s through 1963. Newer pieces, including the ever popular Christmas patterns, are marked with more elaborate Spode manufacturers marks that include pattern names, which make them much easier to identify. Yes, date marks were also used on pieces from the late 1800s through 1963 in addition to the many manufacturers' marks noted above. These can help in dating many Spode and Copeland pieces without the guesswork of matching up the manufacturers' marks to the correct production period. Sometimes these impressed marks -- a letter over a number, like Y over 24, for example -- are hard to read so using a piece of tracing paper to go over them with a pencil may be of help. Or, you can press modeling clay into the mark and then hold it up to a mirror to read what it says. Once you’ve figured out the letter and number, the mark is easy to decode. According to the Spode History blog, the letters translate to J for January; F for February; M for March; A for April; Y for May; U for June; L for July; T for August; S for September; O for October; N for November and D for December. The number below is the year, so Y24 translates to May of 1924. Datemarks from 1963 through 1976 are more complicated and indicated by a single letter. Spode & Copeland Marks and Other Relevant Intelligence by Robert Copeland is a great resource for those wanting to learn more about how Spode and Copeland were marked through the years, including the later datemark letters.